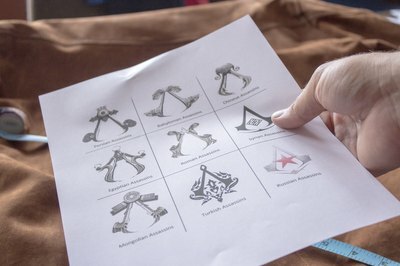 Assassin's Creed, set in 2012, is the subject of an action-adventure series of video games, novels and comics, based on the historic Knights Templar and assassins. The hero, Desmond, a bartender by day, travels back in time in search of artifacts and assassinates those who stand in his way. Themed Assassin's Creed costumes vary depending on the character, but basically consist of hooded tunics and the accessories of a knight. Simple costumes for parties can be made inexpensively with a few basic fabrics and, for those who can't sew, with staples and glue instead of stitching. Measure the person for whom the costume will be made. 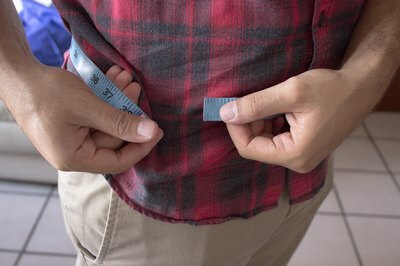 You will need measurements for waist; nape of neck to mid-thigh; shoulder to shoulder; and shoulder to wrist. Cut two rectangles from the white sheet to make the over tunic. The rectangles should be as wide as the shoulder-to-shoulder measurement and as long as the nape of neck to mid-thigh measurement. 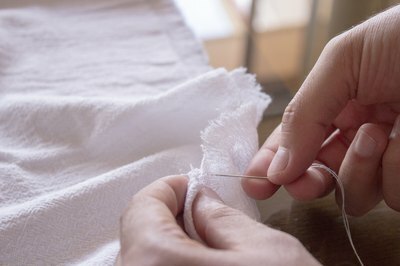 Place one rectangle on top of the other and sew, glue or staple them together at one of the shorter ends, leaving a slit in the middle through which the wearer can put his head. If you can sew, hem the fabric all the way round to prevent fraying. If not, use fusible webbing, which you can iron on, to create a 1-inch hem all around. If the costume is to be worn only once, it's not necessary to hem the tunic. Start by cutting out two triangles. Cut a rectangle from the white sheet, about 15-by-36 inches; this makes the hood. 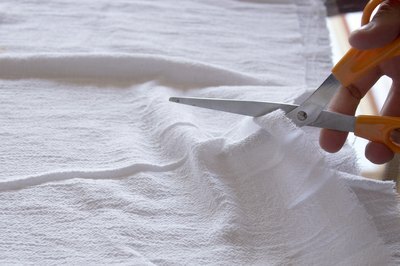 Fold the rectangle in half so that you have a piece of fabric 15-by-18 inches. Sew, glue or staple 12 inches of one side of the fabric, starting at the fold. The hood can also be hemmed all around if you intend to use it multiple times. Sew, staple or glue the fabric together. 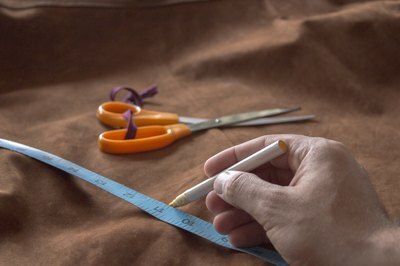 Cut the faux leather fabric to the length and width of the waist size. Add 5 inches to the length to allow for overlap. Attach the buckles and smaller strips of leather to fasten the belt. Add more strips of leather for loops in which to place fake weaponry. Embellish the belt with snap-on studs. Make a faux leather belt. Paint heraldic symbols on the front of the tunic if your character's costume calls for it. For example, Robert de Sable's costume calls for a red cross. Determine how many pieces of the costume you will need to make and how many can be adapted from items in your wardrobe. A pair of black leggings and a long-sleeve white T-shirt will form the basis of the costume, over which you will add a white tunic, a hood and a thick leather belt with holders for fake weaponry. These simple items can be easily adapted to fit any size and embellished with fabric paints, studs and other decoration to customize them to a specific character. How to Make a Hidden Blade in "Assassin's Creed"